If you took a little Tool, some nebulous Nine Inch Nails, a smidge of Filter, and some Alice in Chains sludge and stuffed it into a blender on a low setting, you’d end up with Norway’s Ribozyme. The band’s Presenting the Problem is as good a place to start as any, I suppose. Their latest release is 10 tracks of generally undemanding hard rock music. No Cookie Monster stuff, no death metal to scare the children, no flashy prog bits. Ribozyme came into existence in 1998 and is now a trio. Original members Kjartan Ericsson (guitars and vocals) and Bård Bøge (bass and vocals) hold it down, while drummer Cato Olaisen, who joined in 2006, gives the tracks solid footing with his unpretentious work behind the kit. A lot of Presenting the Problem captures that whole late 90s vibe, except without the pouting and posturing. What we end up with is a Norwegian stew of blended vocals, punchy guitars, captivating melodies, and bass-heavy production. The title track kicks off the record with a little touch of riffing and a simple drum beat. It’s a stripped-down number as it emerges, but it swiftly picks up pace with a weightier slab of guitar and some nice building tension. Ericsson’s vocals are unsoiled and exact, even when he enters somewhat showier terrain during the NIN-inspired chorus. “Leverage” changes things up a bit with a frenzied bombardment of vocal effects, chugging guitar and Olaisen’s unyielding drumming, while “Over the Galvanized” takes a dip in the Alice in Chains pool with harmonizing and some Floyd-like filmy cracklings. The trouble with Ribozyme is that they don’t seem to be the least bit original. They come off less like an original unit and more like the sum of their influences. And the “niceness” of it all gets a bit drab at times, regardless of how satisfying the rock can be to groove to. 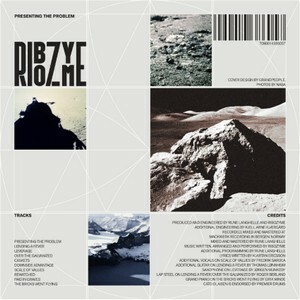 While Ribozyme isn’t a band I’d go out of my way to hear again, Presenting the Problem is an tremendously listenable and workable modern rock record. I’m just not sure that means all that much.